As we begin Lesson 2, let us recall the Unit Mission. The following multifaceted question is the essential question of the unit. It is what you must be able to answer to meet the unit mission. Each lesson will have targets that you must meet. These targets are the components of the unit. 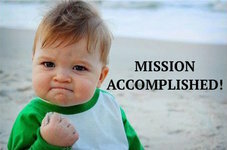 You will use all the targets at the end of the unit to answer the essential question and accomplish the unit mission. What was World War I? What caused it? Who was involved? How was it fought? Why did America stay out of the war at first but later join? How was it fought in battle and at home? How did the war end? What were the immediate, short term, and long term impacts? 1.) I can identify the major European countries involved in World War I on a world map. 2.) I can name and describe the major battles fought in World War I before America entered the war. 3.) I can describe the fighting in World War I before America entered the war. ​4.) I can describe the Christmas Truce of 1914. 5.) 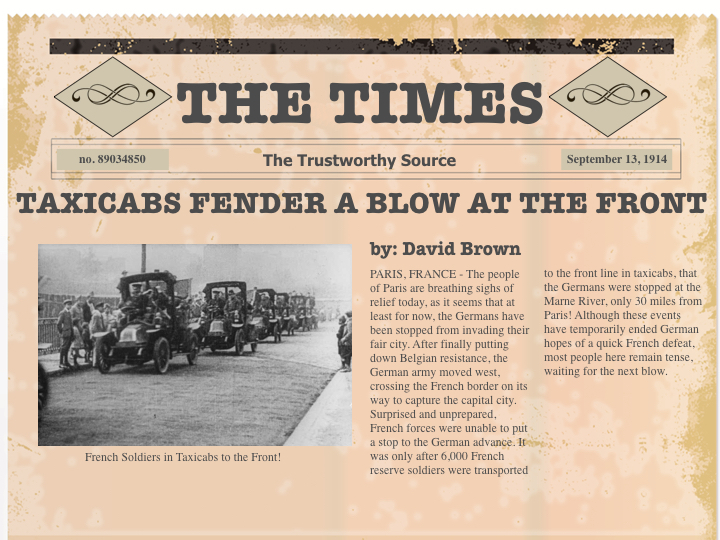 I can explain how newspaper companies used yellow journalism during World War I. 1.) I can identify a supporting sentence in a nonfiction passage. 2.) I can identify a supporting detail in a newspaper article. 3.) I can identify and describe different types of figurative language. 4.) I can infer the meaning of figurative language in a text. Welcome to Lesson 2: The Beginning of World War I. In this lesson, we will read about the beginning of World War I together and do the Lesson 2 Pages in our Lesson Chronicles. Then, you will work in small groups to do an activity called, Ripped From the Headlines. The lesson will end, like always, with your target check activity that you do on your own. After Austria-Hungary declared war on Serbia, the alliance system triggered nation after nation to enter the war. At the beginning of the war, two major sides developed. The major countries belonging to the Allied Powers were Great Britain, France, Russia, and Serbia. The major countries belonging to the Central Powers were Germany, Austria-Hungary, Bulgaria, and the Ottoman Empire. Belgium was a neutral nation until they were attacked by Germany. After the attack in August of 1914, they joined the side of the Allied Powers. Italy had an alliance with Austria-Hungary and Germany but when war broke out, they refused to go to war with Germany and Austria-Hungary. Instead, they joined the Allied Powers in 1915 when they declared war on Austria-Hungary. The United States was neutral until 1917. It was then that the U.S. joined the Allied Powers and declared war on Germany. Although World War I was a world war, most of the major battles were fought in a few key areas. The key areas were the major battles were fought are called theaters. Many battles were fought in each theater. The battle zones or areas where armies faced each other and fought are called fronts. Each side had different strategies or plans for winning the war. In this lesson, you will learn about the strategies used on the important battle fronts, in the major theaters of World War I. When the war broke out and the alliance system brought all of Europe into war, people of the time began calling this war - The Great War. There were several different theaters of war during World War I. The fighting in World War I all started on the Western Front. The Western Front was the fighting zone in Western Europe during World War I that occurred in France, Belgium, and Western Germany. It began in Belgium because the Germans had come up with a plan to fight the war called the Schlieffen Plan. The Schlieffen Plan would be the first strategy of World War I. Long before the first shots were fired in World War I, the Germans were making plans to win the war. In 1904, ten years before the battles began, France, Great Britain, and Russia decided to form an alliance. They felt threatened by the Germans. Germany was building up its army and hinting at the idea that they would like to take control of smaller countries in Eastern Europe. There had been several crises involving Germany as well. Germany knew that war was likely and that they would be faced with a two-front war. Great Britain and France would come at them from the west and Russia would come at them from the east. 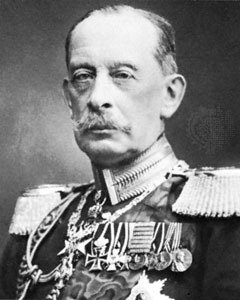 Alfred von Schlieffen was the Chief of the German Army. He came up with a plan to protect Germany in the event that war came to pass. He believed that France was weak and could be easily defeated. He thought if Germany could take France quickly, Great Britain would drop out of the war. He also knew that Russia had a large army and a large country. He believed it would take them at least six weeks to mobilize. He used all of this information to make the Schlieffen Plan. The plan was simple. Germany would send ten percent of the German army to guard the German-Russian border and ninety percent of their army to attack France. Schlieffen knew that France had forts on the French-German border. So, he planned to attack France through Belgium. Schlieffen knew that France would not expect the attack because Belgium was a neutral country. France would concentrate their troops on the French-German border and leave the border between Belgium and France unprotected. Germany would be able to enter France and take control before France even knew what hit them! Because the attack would be a surprise, the French army would be defeated quickly, Great Britain would drop out of the war and the German army would have plenty of time to get to the German-Russian border before Russia could mobilize troops. On August 2, 1914 the German army invaded Belgium. German officials were surprised because Belgium put up a good fight! The German army was not able to move through the country as quickly and easily as they had hoped. The Germans were surprised again when they found that the Russian army had already mobilized and were moving into the German territory of East Prussia. To make matters worse, Great Britain quickly sent troops to France and Belgium to help their allies. While Belgium was holding back the German army on the Western Front, the Russians were mobilizing their army on the Eastern Front. The Eastern Front was the fighting zone in Eastern Europe during World War I that occurred in Eastern Germany, Austria-Hungary, and Russia. It was not long before the Russian army moved into Austria- Hungary and Germany from the east. German commanders had to pull forces from the Western front to stop the Russian advance. The Germans were able to stop the Russians and drive them back in the Battle of Tannenberg. Although the Russian army was much larger, they were defeated by the Germans. The Allied Powers were shocked and devastated. The battle of Tannenberg would be the only battle where Russia advanced into German territory. It was also a sign that the German army would be a tough opponent. There were several battles and events, before the United States entered the war, that were very important. Some of these battles and events occurred in the Western and Eastern Fronts. Others occurred on the Italian Front. The Italian Front was the fighting zone in Southern Europe during World War I that occurred at the Northern border of France and Southern Border of Austria-Hungary. Some of these important battles and events involved naval warfare. Naval warfare is battle fought at sea in a war. Other significant battles and events included aerial warfare. 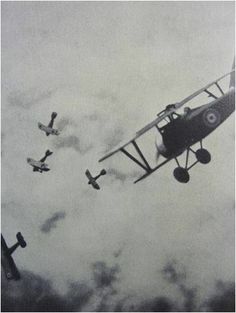 Aerial warfare is using aircraft to fight a war. Please note that some of the links below are not up to date. Those links that are associated with this lesson are up to date. ​It began with the Battle of the Marne in September of 1914. After finally defeating Belgium, the German Army moved west into France. They quickly moved to within 30 miles of Paris. It looked like the Germans were on their way to victory, until France sent six thousand troops from Paris to the frontline in taxicabs to help stop the advance. The Germans were stopped at the Marne River and then pushed back. The Battle of the Marne ended German hopes of a quick victory in France. After the Battle of the Marne, the “Race to the Sea” began. The German and French armies both tried to outflank each other by moving north and east. They ended up at the Belgian coastal city of Ypres at the North Sea, unable to move any further north. It was here that trench warfare began. Trench warfare is a type of fighting in which two enemy armies dig long, deep ditches called trenches facing each other and fight from these trenches. The Germans were the first to build trenches in October of 1914. The trench line of the Western Front stretched from the North Sea to the French-Swiss border, through East France. The Allied troops dug in as well, their trench line barely 300 feet from the enemy trenches. Trench warfare made the Battle of Ypres the first battle in a long line of battles that would end in a stalemate. A stalemate is a deadlock situation where neither side is able to gain ground or win a battle. Trench warfare began at the Battle of Ypres and was used until the end of the war. In August of 1914, the Ottoman Empire joined the war on the side of the Central Powers, but they did not really become involved in war until the Dardanelles Campaign that began in February of 1915. The Dardanelles Campaign was was a battle of the seas. It began when Great Britain sent ships to the Dardanelles Straits to gain a way to get supplies to Russia. The Allies hoped that by opening another front, they would be able to break the war's stalemate. After the British landed at Gallipoli, a peninsula in South Turkey, the Ottomans fought much harder than expected. After a year of heavy fighting and casualties, the British were finally forced to evacuate the region. In February of 1916, the Germans planned a siege of Verdun, a fort in northeast France. This fort was special to the French. Germany and France fought a war in 1870 called the Franco-Prussian War. In this war, the fort at Verdun was the last fort to be taken by the Prussians. The French were not about to lose it to the Germans again. The weather had been really harsh in Verdun in 1916. This gave the French time to call in reinforcements. Not only were they able to hold off the Germans, they eventually launched a counter- offensive to drive the German Army back. After 11 months, France was victorious. Their win was a big morale boost and Verdun became a symbol of French resistance. ​During the battle of Verdun, the bad weather also bought France some time to reach out to Russia for help. The Russians answered the French call for help by launching an offensive on the Eastern Front to lure German troops away from Verdun. The Russians were not prepared and the muddy conditions of the spring thaw. The muddy conditions kept them bogged down and made them easy targets for the German artillery. The Battle of Lake Naroch was considered a complete failure for Russia because the Germans were able to push them back without taking any of their forces away from the fight in Verdun. While the French were fighting in Verdun and the Russians at Lake Naroch, the British launched an offensive against the German line near Somme, France to draw the German army away from Verdun and help the French. The British thought they would win the Battle of Somme if they just kept charging the German line, but they only ended up taking huge casualties and gained no ground. Although this battle became a symbol of British determination, it also showed the uselessness of the tactics that were being used in this war. Both sides recognized they needed to develop new weapons and strategies if they wanted to win. Germany learned their lesson at the Battle of Somme. So, the German military decided to reorganize their air force. They trained air pilots to dogfight. A dogfight is combat or fighting with military airplanes. In April 1917, at the Battle of Arras, the Imperial German Army Air Service destroyed Great Britain's Royal Flying Corps, taking down three times the number of British planes than Britain took in German planes. The British lost 245 aircraft, 211 aircrew killed or missing and 108 as prisoners of war. The German Air Services lost 66 aircraft from all causes. When Italy joined the Allies in 1915 another front opened up on the Italian border. In the beginning, the battles fought on the Italian front were mainly between Italy and Austria-Hungary. In October 1917, the Germans were able to send forces, they were able to push through the Italian line and move towards Venice. It appeared that the Battle of Caporetto would be a victory for the Central Powers. Eventually, the Central Powers were stopped when British and French troops arrived to help and a new line was established. The Battle of Caporetto was one of the few battles in which gains were made by either side in the war. The battles of World War I were important, but there was one event that happened during World War I that was more profound than any battle that was fought. It was Christmas Eve, 1914. The leaders of the British and German armies both commanded their armies to continue battle over Christmas Day. It was damp and rainy and that night the weather gave way to a cold, icy frost. British soldiers huddled together in a trench, desperately trying to keep warm. Three hundred feet away, German soldiers were doing the same. The German soldiers decided to try and make the best of the night. They began lighting candles and decorating their trenches with Christmas knick knacks that loved ones had sent them from home. As the night grew darker and colder, a silence fell over the Western Front. Then, the British soldiers heard something familiar. It was the Germans singing Silent Night. A British soldier began to sing it along with them in English. One by one, British soldiers joined in the singing. The Germans heard them from their trench line across the way. The Germans began singing other carols and this time, the British soldiers all joined in. A couple of soldiers on both sides began to peek over the trench walls at the other side. The Germans began calling to the British - asking for a Christmas Truce and inviting them to celebrate Christmas together. The British were reluctant at first. They were scared it was a trick, but something happened. One man emerged from the trench and made his way slowly to the German line. One German soldier did the same. The men met in, No Man's Land, the area between the two enemy trench lines. The men shook hands and wished each other Merry Christmas. Soon, soldiers from both sides emerged. The British and German soldiers exchanged gifts and took photos. They were happy to have an opportunity to leave the damp trenches. They allowed each other to take care of their dead and wounded soldiers in No Man’s Land. They played games and talked with each other. For one day, the soldiers, the people who were risking their lives for their countries decided to call the shots. They defied their commanders orders, called a truce, and celebrated together. They chose peace. They chose kindness to their fellow men. Some of the French soldiers heard about the truce and were angry. They did not think their allies should be celebrating with their enemy. Newspapers also heard about the truce and reported it to the people at home. Government leaders began to fear that the soldiers were planning a mutiny and that the soldiers' actions would cause the leaders to lose the people's support for the war. The leaders immediately sent word to the lines that all truces should be stopped and that anyone that refused to fight would be tried by court martial. Eventually, the soldiers would find themselves fighting each other once again, but their story of peace became legendary. I have embedded the Lesson 2 Chronicles below. These are the pages on your Lesson Chronicles Folder that you must complete with your group after we read the text. Now we need to analyze what we have learned. This activity is called Ripped from the Headlines. This is a multi - step activity. First, you will learn about figurative language and how it was used in headlines to sell more newspapers before and during World War I. Then you will view news articles about different events in World War I. With your group, you will use what you learned about figurative language to identify the type of figurative language that is being used in each headline. You will complete a poll for each newspaper so that you can see what you think compares with others. Next, you will complete a survey for each newspaper as a group. In the survey you will tell me what the title means and identify one supporting detail from the newspaper that supports the title. 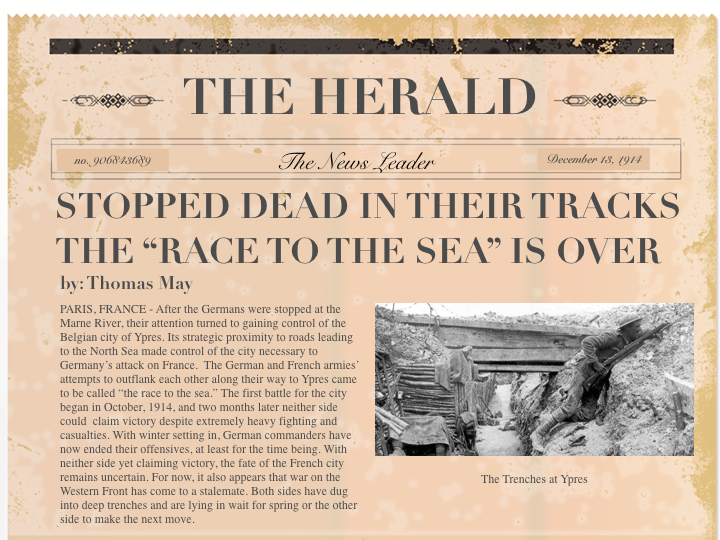 Finally, you will create your own newspaper article by choosing one type of figurative language to create a headline and reporting on one major battle or event in World War I. Anyone who has ever read a good book can tell you what makes a book good and what makes a book bad. Good books do not just list facts or spout off information, they describe and explain. Good books paint vivid pictures in the reader's mind. Good books use our senses and emotions to help us connect with what we are reading. They appeal to our personalities and help us use what we already know to learn new things. One technique authors of good books use in their writing is figurative language. Figurative language is just a fancy term for words that mean more than meets the eye. It uses figures of speech to build meaning beyond their actual meaning. Think of figurative language as words that have more than one level of meaning. ​It did not take long for newspaper companies to understand that people were much more willing to spend their hard earned money on a newspaper with an interesting headline opposed to newspapers with literal or boring headlines. Many newspaper companies used figurative language in their titles to lure people in to buy their company's newspapers. There are many types of figurative language. Today you will examine 12 of them. As a group, read the definitions and examples of each type of figurative language listed below. Alliteration is a series of words that having the same first consonant sound. A better butter makes a batter better. Sally sees seashells by the seashore. An allusion is when the writer or speaker refers to a person, thing, or event that happened in history, is written in literature, or is a part of popular culture. Don’t act like a Romeo in front of her! He has a major Napoleon complex! A hyperbole is a figure of speech where the writer or speaker exaggerates to emphasize their point. I am dealing with a million and one things right now! An idiom is a funny or commonly used expression that means something different from what it appears to mean. It is raining cats and dogs outside. Riding a bike is a piece of cake. Imagery is a form of figurative language where the author or speaker creates pictures in the reader's mind by using words that describe what is seen, heard, smelled, tasted, or felt. Her ring shimmered brightly in the sunlight. The comforting aroma of baking bread filled the room. When the author or speaker says the opposite of what they actually mean to be clever or humorous. I just love when you complain all day. Thank you for not cleaning up your mess! A metaphor is a figure of speech that directly compares two things. Metaphors do not compare two things using the words "like or as" but usually compare two things using the word "is". This classroom is a zoo! Onomatopoeia is a word or figure of speech that sounds like what it is describing. Ticktock, ticktock… the sound of the clock was all that could be heard in the hospital waiting room. "Pow," the car engine backfired loudly. An oxymoron is a figure of speech that occurs when two opposite or contradictory words are together in one phrase. I'd like to order the jumbo shrimp. Our team's victory was bitter sweet. Personification is when the author or speaker gives human qualities or characteristics to things that are not human. The sun smiled down on the children as they played. If Justice is blind, then her scale must be rigged! A pun is a phrase that suggests two or more possible meanings to be witty or clever. The Energizer Bunny was just arrested and charged with battery. A simile is a figure of speech that makes a comparison between two different things using the words, “like” or “as”. Your hands are as cold as ice. He looked like a drowned rat. Now you will play the That Figures Game to practice identifying each type of figurative language. Click on That Figures icons below to play a game identifying different types of figurative language. ​For Step 5, your group needs to look at each newspaper headline below. With your group, discuss which type of figurative language you believe is used in each headline. 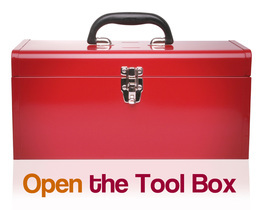 Allow each group member to state what they think and why they think it. When you give your opinion, remember to back it up using the definitions and examples given for each type of figurative language. After everyone has shared, take a moment to reflect on what other group members have said. Did they convince you of something different that you originally thought? If not, why is your opinion correct? After reflecting upon the discussion, vote on the figurative language type by completing the poll next to each newspaper article. You may do step 6 while you are doing step 5 or after you complete step 5. In step 6, you will complete a survey for each newspaper's headline. As a group, you will read each newspaper article. Then determine the meaning of the headline. Find one supporting detail in the article to support you answer. You will type these into the survey and submit it to me as a group. 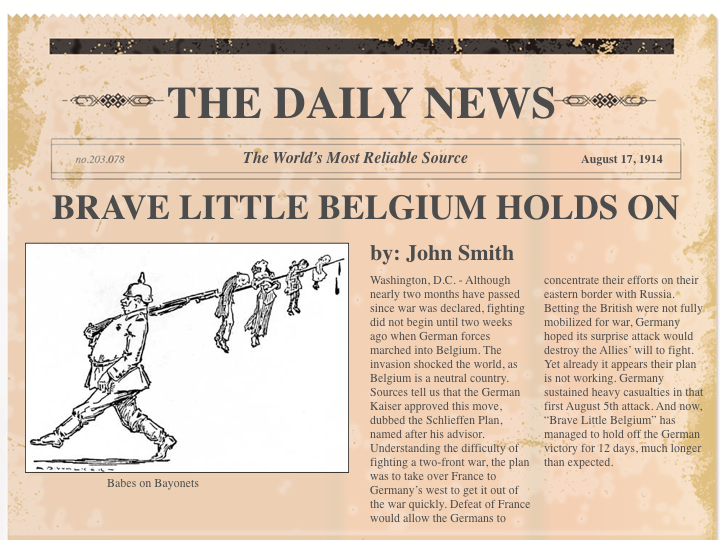 Which type of figurative language does "The Daily News" use in their headline, “Brave Little Belgium Holds On”? 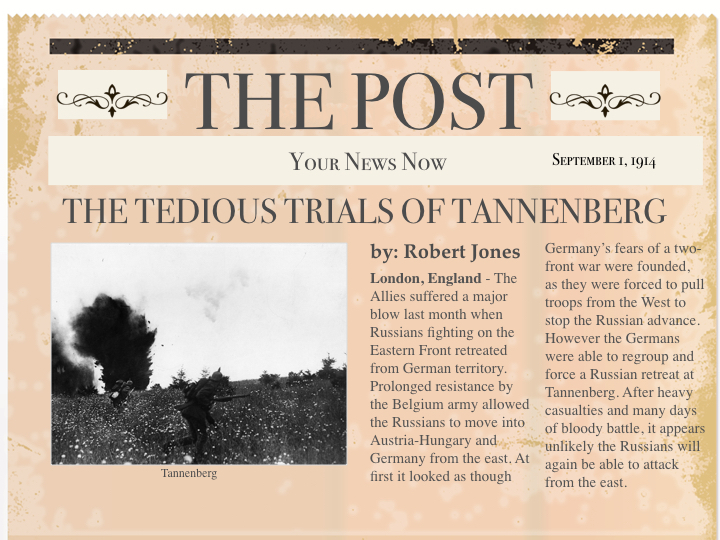 Which type of figurative language does "The Post" use in their headline, “The Tedious Trials of Tannenberg”? Which type of figurative language does "The Times" use in their headline, “Taxicabs Fender A Blow at the Front”? Which type of figurative language does "The Herald" use in their headline, “Stopped Dead In Their Tracks - The Race to the Sea Is Over”? 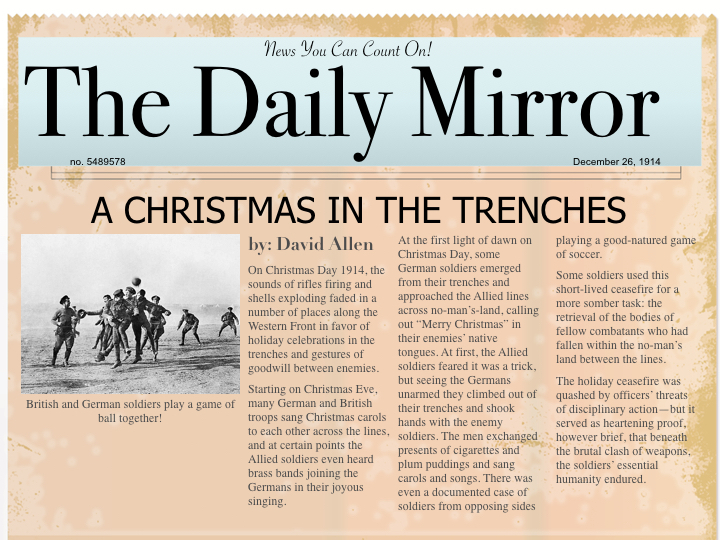 Which type of figurative language does "The Daily Mirror" use in their headline, “Christmas in the Trenches”? 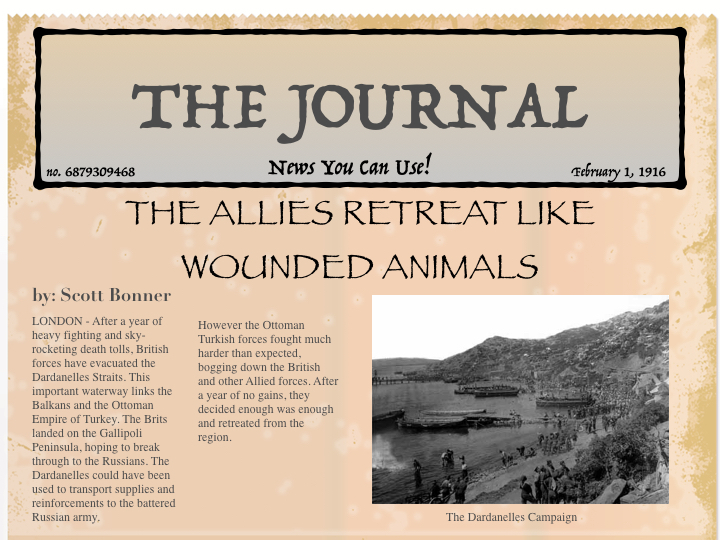 Which type of figurative language does "The Journal" use in their headline, “The Allies Retreat Like Wounded Animals”? 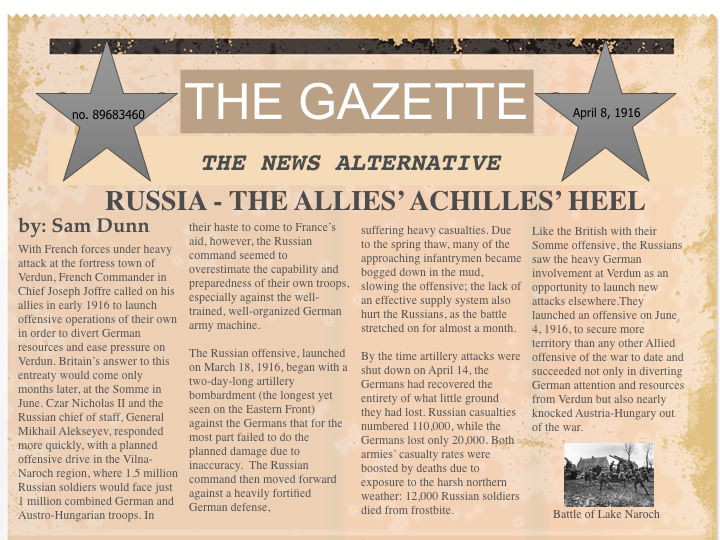 Which type of figurative language does "The Gazette" use in their headline, “Russia - The Allies' Achilles' Heel”? 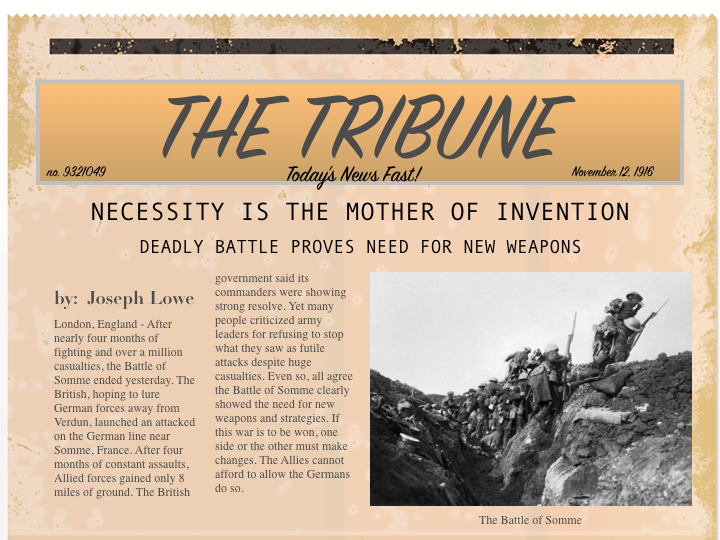 Which type of figurative language does "The Tribune" use in their headline, “Necessity Is the Mother of Invention - Deadly Battle Proves Need for New Weapons”? 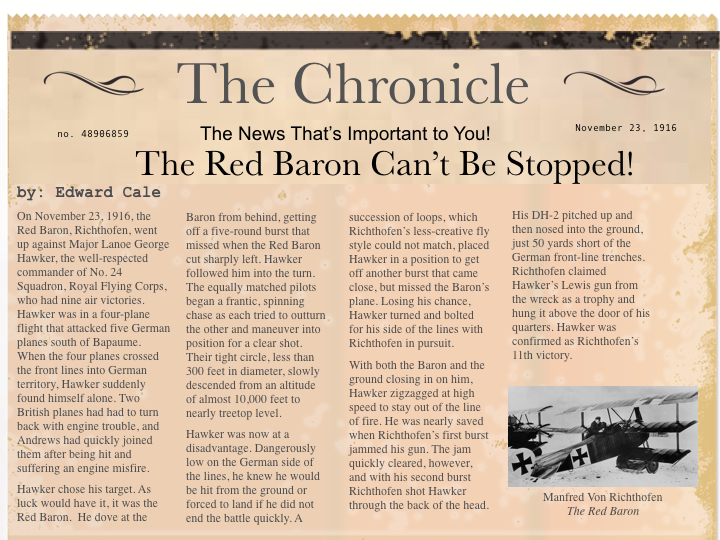 Which type of figurative language does "The Chronicle" use in their headline, “The Red Baron Can't Be Stopped!”? 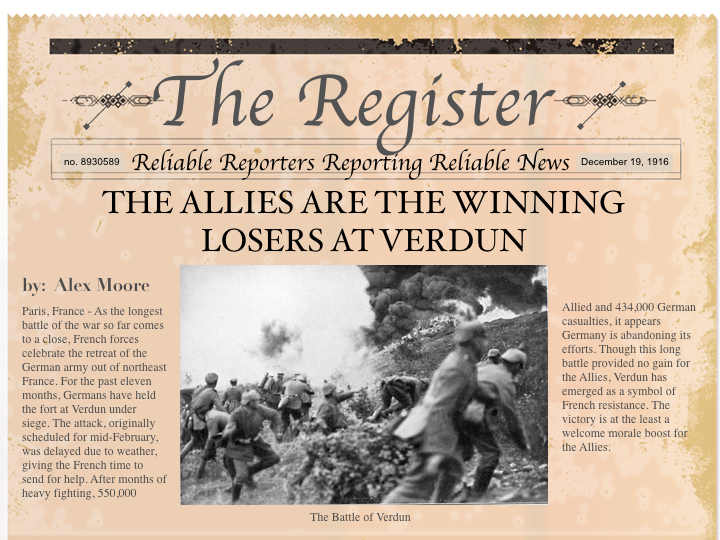 Which type of figurative language does "The Register" use in their headline, “The Allies Are the Winning Losers At Verdun”? 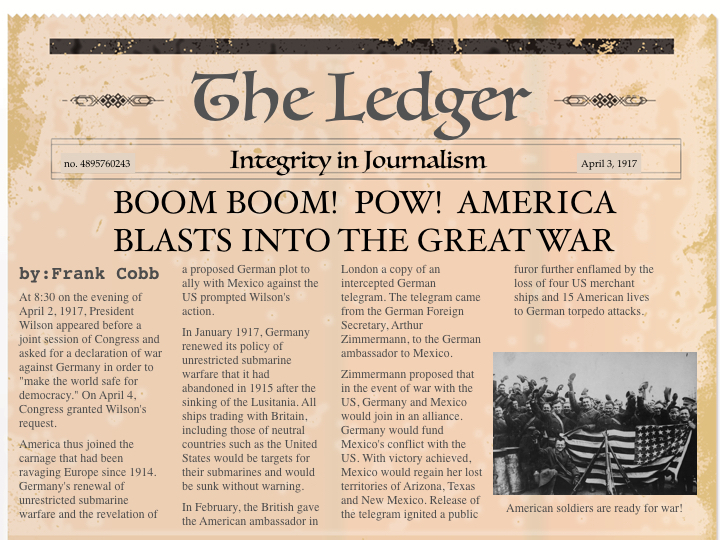 Which type of figurative language does "The Ledger" use in their headline, “Boom Boom! Pow! America Blasts Into the Great War”? 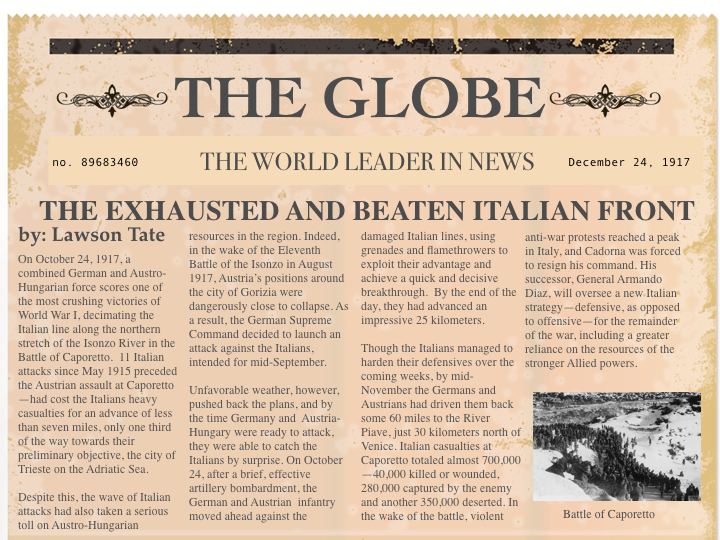 Which type of figurative language does "The Globe" use in their headline, “The Exhausted and Beaten Italian Front”? The last step in this activity is to create your own newspaper headline and article. First, choose one battle or event that has been discussed to report on. Next choose one type of figurative language to use for the title. Third, click on the fodey.com icon below to create your headline and article. Fourth, create a name for the newspaper and type into the first line. Fifth, type in the date of the battle or event you chose. Sixth, create a headline using the figurative language type you chose. Seventh, type a one paragraph summary of the battle or event that you chose. Eighth, click generate when you are done. Ninth, click the link that reads, "download your image." When it pops up on your screen, click on the name of the image. Change it to your first and last name and save. Finally, air drop your article to me. I will print these out and hang them in the hallway. I might even display them in an online gallery. If we have time, we will do two extension activities. First, we will play History Pursuit using all the information that you have learned about World War I so far. Remember, in this game, each table is a team. I will ask you a question about the lesson and if you get it correct, you get to draw a letter from the Pursuit Bucket. I will ask each team questions until a team can make one or more of the following World War I Terms with the letters they draw from the Pursuit Bucket. Remember, your table is a team with every class who sits at your table. We will make a list of all the words created by each table. The table who makes the most words by the end of 7th period wins the game! You can play history pursuit at home for fun if you like. Just click on the icon below. The second extension activity is a video clip. This video clip is actually a commercial but does an excellent job of reenacting the Christmas Truce. We will watch it as a class, but if you have ear buds, you can watch it anytime you like. To watch it, simply click on the play button in the video below. You completed a target check at the end of each center. Now, you need to complete the Lesson Mission Check. In this activity, you will check to see if you understand all the major concepts of each center. The Lesson Mission Check will also check to see if you understand how all of the centers relate to each other. In other words, it will assess whether or not you understand the fighting that occurred in World War I. 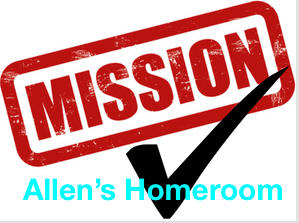 To take the Lesson 2 Mission Check, click on the icon with your homeroom name below. YOU HAVE COMPLETED THE LESSON 2 - THE BEGINNING OF WORLD WAR I MODULE!